I can’t tell you how many clients and athletes I’ve seen over the years with a set of stiff or cranky shoulders. And while there’s no such thing as a “one-size-fits-all” approach to keeping your shoulders healthy, this one simple cue can make a world of difference. How to apply it in exercises you’re probably already doing. So without any further ado, let’s jump into this week’s video! Reach! I know it’s the focus of the entire video, but the goal here is to reach l-o-n-g. And don’t let the chest cave or round over; think about keeping the chest out and making the arms long. Don’t force the inhale! Often when working to drive air into restricted areas, people will have a tendency to over-breathe. Instead, think about making your breathing fluid and relaxed and driving it only into the specific area(s) you’re targeting. Start with the posture and position that allows you to be successful. Don’t start with any preconceived notions here – just because you can crank out a set of 20 push-ups doesn’t mean you can drive into the correct areas. Leave your ego at the door and work to do things right. 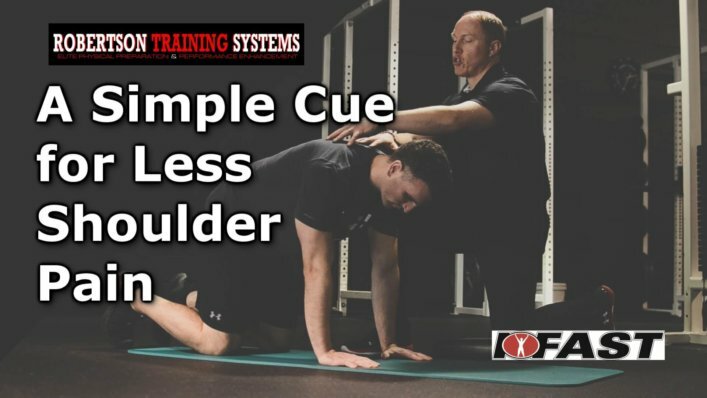 While this cue may sound simple at first glance, I can assure you, integrating it into your movement is not always easy to do. But, if you make this a focus of your training, I can assure you – your shoulders will reap the benefits as a result. Does that apply with bear Crawls? And hips back hinge? will this help bicep tendonitis?